to a very poor standard. However for some reason the renovation was not done to their normally high standard. The renovation came complete with an impossible "horse stile", an unsafe gate that slams shut in 2 seconds and large sharp granite aggregate surface that is injurous to horses' hooves. Yet another bridleway in the same parish has been renovated to a high standard of surface and with brand new bridleway gates. The British Horse Society reported all these serious issues to Cornwall Council on behalf of local riders in April but the Council's Countryside Service did not respond or address the issues in any way. The Council continued to refuse to take any action so the British Horse Society served notice under section 130a of the Highways Act for the Council to remove the obstructions. In response to the 130a notice the Council subsequently admitted that the horse stile had not been appropriately authorised and they have now removed it. In the same response the Council has refused to modify the gate so that it is usable with ease and safety by all equine users and in both directions Subsequently the Council have said they will mke minor adjustments to the gate. The Council has refused to put a suitable top dressing on the extremely large sharp granite chippings so that it is an acceptanble surface for horse's hooves to walk over. 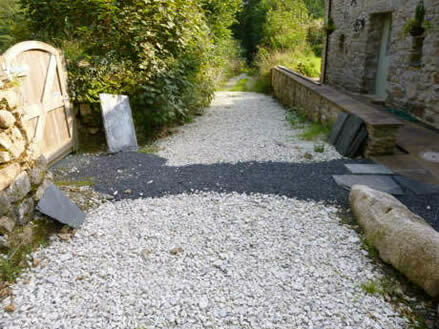 A major concern is the cost of this "renovation" which seems out of all proportion to the length bridleway worked on and the standard of the finished result. Previous renovations costing a similar amount have done at least three times as much length of bridleway and to a very high standard with all new drainage and leats installed. Cardinham 12 renovation is three times as long (the whole bridleway) finished with high standard of surface and brand new hardwood gates. We do not yet know the cost of that renovation. The British Horse Society is very pleased that bridleways are being renovated BUT is concerned that the work done should give best value for money and is of a good standard for use by horses. (length) in 12 inches of deep mud, at the top of an incline. further up the totally enclosed lane and there are no more gates below it. The gate was not recorded on the council survey done 5 or 6 years ago. A full width gate set in such a narrow lane the width of which is less then the length of a horse is always going to very difficult to operate even if not self closing. It is believed the gate is purely there to mark the boundray between landowners. The BHS considers that gate should be removed as there is no stock either side. 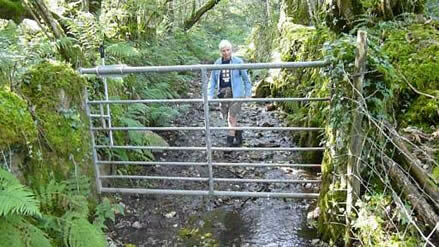 This steel gate is across the full width of the bridleway lane which is only a fraction over 6 foot wide. Ignoring the gate It is extremely difficult to turn a large horse. The gate self closes with forceful gravity in less than 2 seconds. It is very difficult/unsafe to even lead a horse through and hold the gate. Coming down the bridleway against the gate means that the gate has to be used to shove your horse through with his head turned into the sheep netting and barbed wire. There is no requirement for the gate for stock management as there is another gate further up the totally enclosed lane and there are no more gates below it. A section of the 'renovated; bridleway where it passes a cottage. An estimated 150 metres of the bridleway have been 'renovated' and with this surface. 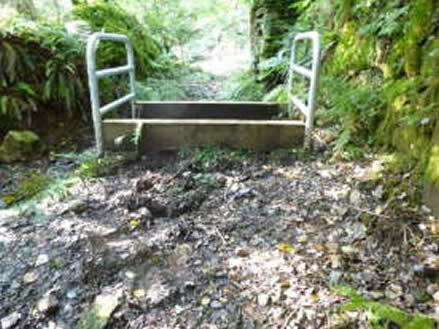 If this surface and the gate are considered acceptable and are allowed to remain this will have very serious implications for future enforcement of acceptable bridleway standards.